S.O.U.L Sisters Leadership Collective | S.O.U.L. Sisters Is Featured In A Book! We are excited to announce that S.O.U.L. 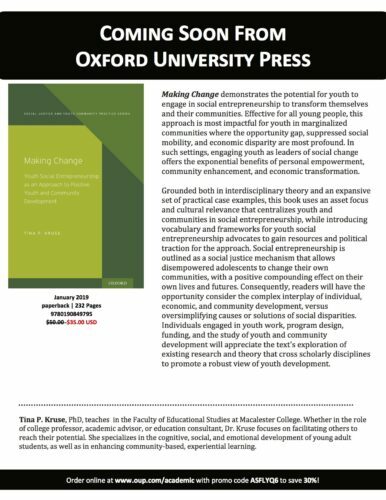 Sisters and our Youth Social Entrepreneurship Program (YSE) are featured in Tina P. Kruse’s new book, Making Change: Youth Social Entrepreneurship as an Approach to Positive Youth and Community Development! Interested in learning more? This book is officially published, so you can order it online at www.oup.com/academic today! Don’t forget to use the promo code ASFLYQ6 for 30% off!